Scientists have created a crystal structure that boosts the interaction between tiny bursts of light and individual electrons, an advance that could be a significant step toward establishing quantum networks in the future. Today’s networks use electronic circuits to store information and optical fibers to carry it, and quantum networks may benefit from a similar framework. Such networks would transmit qubits – quantum versions of ordinary bits – from place to place and would offer unbreakable security for the transmitted information. But researchers must first develop ways for qubits that are better at storing information to interact with individual packets of light called photons that are better at transporting it, a task achieved in conventional networks by electro-optic modulators that use electronic signals to modulate properties of light. Now, researchers in the group of Edo Waks, a fellow at JQI and an Associate Professor in the Department of Electrical and Computer Engineering at the University of Maryland, have struck upon an interface between photons and single electrons that makes progress toward such a device. By pinning a photon and an electron together in a small space, the electron can quickly change the quantum properties of the photon and vice versa. The research was reported online Feb. 8 in the journal Nature Nanotechnology. The new interface utilizes a well-studied structure known as a photonic crystal to guide and trap light. These crystals are built from microscopic assemblies of thin semiconductor layers and a grid of carefully drilled holes. By choosing the size and location of the holes, researchers can control the properties of the light traveling through the crystal, even creating a small cavity where photons can get trapped and bounce around. ”These photonic crystals can concentrate light in an extremely small volume, allowing devices to operate at the fundamental quantum limit where a single photon can make a big difference,” says Waks. The results also rely on previous studies of how small, engineered nanocrystals called quantum dots can manipulate light. These tiny regions behave as artificial atoms and can also trap electrons in a tight space. Prior work from the JQI group showed that quantum dots could alter the properties of many photons and rapidly switch the direction of a beam of light. 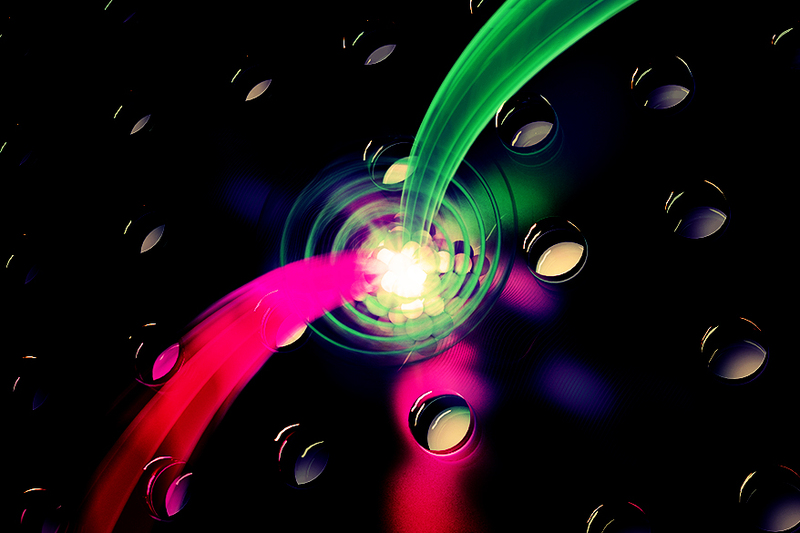 The new experiment combines the light-trapping of photonic crystals with the electron-trapping of quantum dots. The group used a photonic crystal punctuated by holes just 72 nanometers wide, but left three holes undrilled in one region of the crystal. This created a defect in the regular grid of holes that acted like a cavity, and only those photons with only a certain energy could enter and leave. Inside this cavity, embedded in layers of semiconductors, a quantum dot held one electron. The spin of that electron – a quantum property of the particle that is analogous to the motion of a spinning top – controlled what happened to photons injected into the cavity by a laser. If the spin pointed up, a photon entered the cavity and left it unchanged. But when the spin pointed down, any photon that entered the cavity came out with a reversed polarization – the direction that light’s electric field points. The interaction worked the opposite way, too: A single photon prepared with a certain polarization could flip the electron’s spin. 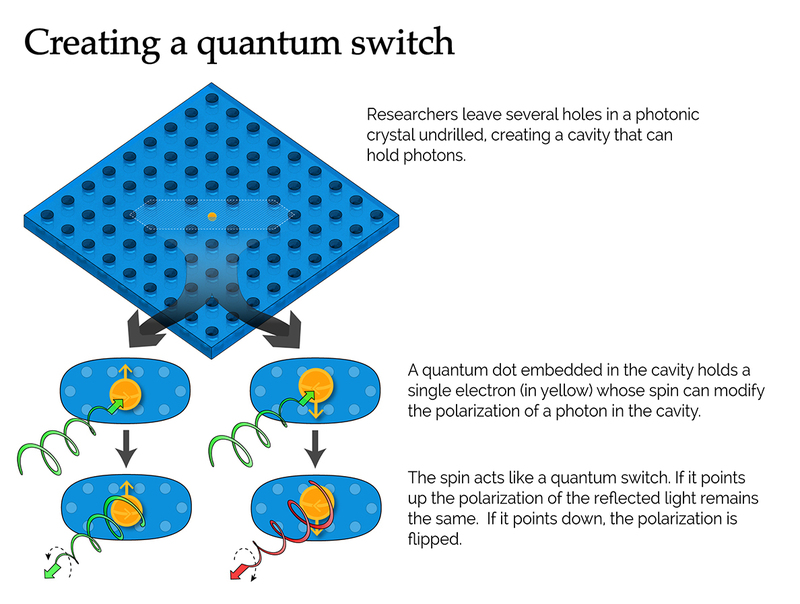 Both processes are examples of quantum switches, which modify the qubits stored by the electron and photon in a controlled way. Such switches will be the coin of the realm for proposed future quantum computers and quantum networks. Those networks could take advantage of the strengths that photons and electrons offer as qubits. In the future, for instance, electrons could be used to store and process quantum information at one location, while photons could shuttle that information between different parts of the network. Such links could enable the distribution of entanglement, the enigmatic connection that groups of distantly separated qubits can share. And that entanglement could enable other tasks, such as performing distributed quantum computations, teleporting qubits over great distances or establishing secret keys that two parties could use to communicate securely. Before that, though, Sun says that the light-matter interface that he and his colleagues have created must create entanglement between the electron and photon qubits, a process that will require more accurate measurements to definitively demonstrate. In addition to Waks and Sun, the paper has two additional co-authors: Glenn Solomon, a JQI fellow, and Hyochul Kim, a post-doctoral researcher in the Department of Electrical and Computer Engineering at the University of Maryland.